I’ll admit, I’m terrified to write about what looks good and bad to get in the tribal decks that are coming out on the 25th, and lots of people are writing about what looks good to pick up. I’m very likely to get the Dragon deck, and possibly the Vampire one too, and I’m relatively certain that they will be stuffed full of value. I am not getting anything related to the decks until I see some decklists, though. Today, though, I want to look ahead about six weeks: September 28, 2017 is when Ixalan is released and at that time, Shadows over Innistrad block and Battle for Zendikar block will rotate out of Standard. These cards are mostly at their lowest point, aside from the ones already seeing a lot of Modern and Legacy play. Hard to believe, but the two years that Gideon, Ally of Zendikar has spent looming over Standard is over. So let’s see what’s worth picking up. Ulamog, the Ceaseless Hunger ($13/$37 foil): This is a touch higher than I want to pay for this card right now. I would much prefer to be picking up nonfoils at $10 or less, because the appeal is there. Tron is popular in several flavors, but almost all of them have at least one of this monster lurking. The cast trigger is incredibly powerful in Commander too, and the only caveat is that we likely aren’t far from FTV: Eldrazi. Foils for this card were as high as $80 when this was first adopted into Tron decks, but it’s now down to the $40 range and I think that’s a very good price. A reprint in foil is very unlikely, and even something like an FTV wouldn’t ding the original much. Seeing this double, and getting back to the $80 range in 12-18 months seems like a safe bet. Shambling Vent ($3/$8): Yes, it’s unexciting, but it’s seeing a surprisingly significant amount of play in Modern. There are a lot of different black/white decks, and in this case, I am aiming for $2 pickups. I don’t think there is the same long-term appeal for foils, but creaturelands have been shown to be some of the more consistent players in the format. Foils are a good target too, but I think it will take a lot of time for these to go up. If you’re patient, it’s a good play. Part the Waterveil ($2/$7): I’ve sung the virtues of this card before, but even the publicity over the Taking Turns deck this year wasn’t enough to keep this price up. This is the best of the newer extra turns cards (new ones all exile themselves) because the Awaken ability is a game plan all its own. I don’t think these will go much lower, and the growth potential is there. Sanctum of Ugin ($0.75/$5): I love foils here for long-term growth. This is one of those cards that will just keep getting better with each colorless creature that’s printed. Having some foils put away for the inevitable spike will make you feel good. Wastes, Full-Art, foil ($8-$10): There’s two full-art Wastes that you can pick up, and I think foils for this are rock-solid to go up. I know other writers have mentioned this card, even as far back as the release of this set, but getting these at $10 or under will pay off handsomely. 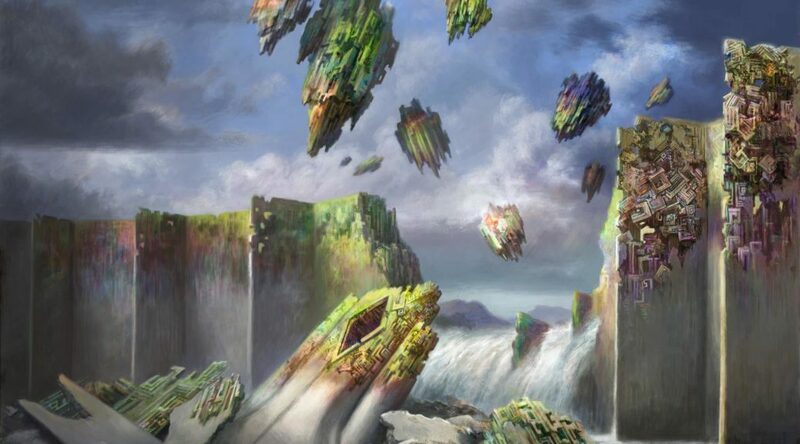 I doubt that even if they decide to add colorless to Modern Masters 2023 or whatever, they will recycle the art. There’s a lot of casual demand for basic lands that are colorless, and Tron decks often run one or two, for something to find when Path to Exile lands. Sea Gate Wreckage, foil ($3): The casual market is slowly sapping the supply on this card, and it shows up as a spicy one-of in a lot of different Modern lists. If you’ve ever seen someone use this on camera, you know how helpless the other player feels. When this hits, it’ll break $10 or more. Thank me later. Stormchaser Mage, foil ($4): If you’ve seen blue-red Delver decks on a stream, you’ve seen these in play as a flying Swiftspear. It all depends on your level of comfort picking up niche Legacy cards. This was a three-of in the 9th place Legacy deck at the SCG team event three weeks ago, and I feel like it’s one good event away from hitting it big. Chandra, Flamecaller ($5/$12): She is rarely a bad card to have on your side, and what’s really appealing is the range of possibilities. I don’t think she will fall much farther, so getting her now and being patient is the plan. Remember that this set got opened less than the sets around it, due to the Eldrazi menace and the effect on packs. For that same reason, I like picking up the Expedition filter lands–the supply on these is a lot lower than you think it is. Eldrazi Displacer ($4/$12): If you didn’t want to listen to us when it came to Reality Smasher or Thought-Knot Seer foils, well, please take those lessons to heart: The Displacer will spike too. There’s less Modern play for this, but a lot more casual demand. At this writing, there’s about 110 available on TCGPlayer, and that’s for the pack foil and the prerelease foil combined. (for reference, Sylvan Advocate, a card which was ever-present in Standard for quite a while, has 175 pack foils and 140 prerelease foils) I know it’ll go to $20. I wouldn’t be shocked if it got to $30 considering the appeal in Commander. Cliff has been a mostly-casual player since his first Revised packs in 1995, and has sold out/rebuilt his collection several times. His favorite format has shifted from Commander to Cube in recent years, and the range of ways to play are always amazing to him. You can read his weekly Friday pieces here on MTGPrice or follow him on Twitter @Wordofcommander.